As part of a collaborative study with the NYS Department of Environmental Conservation (NYSDEC), Peconic Baykeeper (PBK) set crab pots in the summer of 2017 in the Peconic and South Shore bays. PBK was specifically tagging spawning female blue crabs so that their movements could be studied throughout the season as the waters warmed up. Throughout the winter, blue crabs bury in the mud and slow their bodies down to conserve energy. As waters warm in late spring, the crabs move into brackish (mix of fresh and salt) water to lay eggs. As the overall yearly temperatures of our waters warm, scientists may see a change in this seasonal movement. The blue crab tagging program is an initiative of the NYSDEC, designed to investigate the migration patterns, habitat preferences, and life history traits of blue crab (Callinectes sapidus) in New York’s waters. 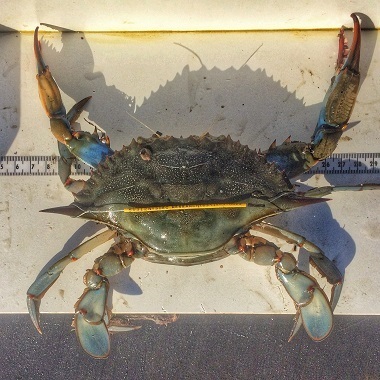 Mature female blue crabs are tagged with a yellow wire carapace tag which has a specific number attributed to each crab. This tag is attached externally to the crabs’ two lateral spines. For more information on this project, and what to do if you are lucky and recapture a tagged crab, visit the NYS Department of Environmental Conservation website.